Any party or coalition that comes to power after the May election will have have to re-address the two main aspects of the government-social digital landscape. One the one hand they’ll need to continue to use tech in transforming and improving services (and saving money), driven from the top. On the other they’ll have to continue to support ways to help more people get online to use the services, as well shopping, working, learning, socialising and doing all the other good stuff the Internet enables. The landscape can be pretty confusing, with score of different programmes, agencies and organisations in the innovation, transformation and digital inclusion businesses. Fortunately a small group in the Department of Communities and Local Government, led by William Barker, have done a great job of surveying and mapping, and come up with a draft blueprint that begins to show who’s who, who is doing what, and how they relate. Click to enlarge, or see the original here. On the left side of the diagram is stuff that government has to get right, including access, affordability, usability, and standards – and on the right are the activities government wishes to support … and hopes other people will get right. These include health and well-being, community participation, quality of life, supporting learning, and economic and working choices. 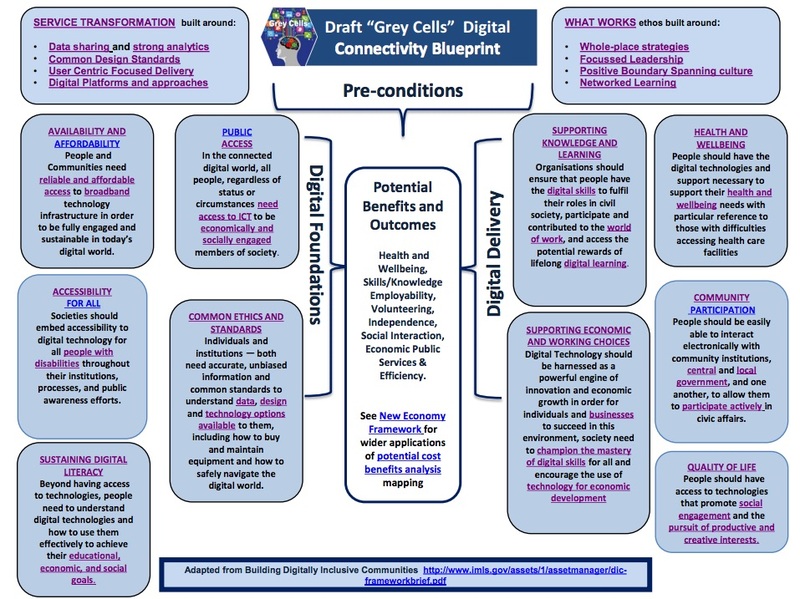 Each of the “Grey Cells” has links to back up documents, and William explains on the Public Service Transformation Network blog how they developed the framework. As I wrote earlier, the Grey Cells work evolved from an initial focus on digital connectivity for older people, and you’ll find in my post links to a really impressive database of local case studies and good practice, a resource pack, as well as results from a number of events. It’s a model of how other cells could be filled out from the policy-makers perspective. 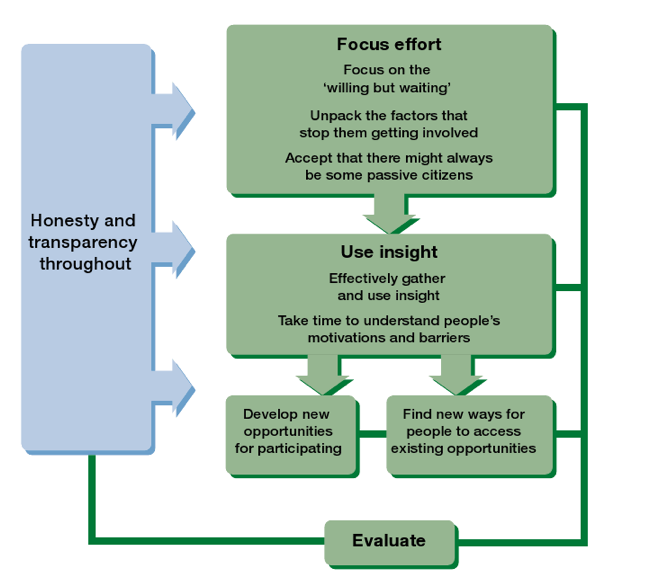 How to populate the right side of the blueprint with day-to-day stories, conversation and connections that complement the official reports and programmes. Unless everyone involved can talk about the issues and opportunities, little will change. There are some stories and practical ideas there already, and I hope to help, with others, through the Ageing Better exploration. Earlier posts here. How to enable people in public services to connect and collaborate online with anyone else. Civil servants can meet face to face, some can blog and maybe tweet, but many sites are blocked to their desktops and using anything as simple as Google docs or Quip.com seems extremely difficult. They are digitally excluded. How to make progress when many of the organisations don’t understand or use current digital tools – as John Popham says here – and there are additional cultural challenges. And most importantly, how to enable personalised engagement. None of this works unless people, individually, decide to start to use digital tools and services, and connect with others. Maybe a minimum personal technology assessment kit would help. The good news is that we now have a framework within which to address the challenges, and come up with some ideas for moving forward. I just hope no politician decides to “weaponise” the digital divide in election campaigns. It’s more complicated than that, as Grey Cells shows us. Downloading Democracy 2013 – Archived Live Stream from John Popham on Vimeo. Earlier this week Lobbi, a new initiative promoting citizen engagement and action through social media, hosted a Downloading Democracy event in London. You can that see that it was a well-informed and lively affair from Mick Fealty’s excellent report, the live stream recording and Storify from John Popham. As well as convening the event, Lobbi is developing a new online platform, outlined in this interview with Mick by the founder and initial funder of Lobbi, Hussain “Hoz” Shafiei. As he explains on his Linkedin profile, and the interview, Hoz is “an Iranian by blood an Arab by birth and an Englishman by upbringing” with a passion to revive UK politics with an demonstration of what might also make a difference to other nations and cultures. I returned to the UK in 2011 and decided to no longer work in a commercial industry and started on my journey to enhance global democracy. It is for this reason that I started Lobbi a project that will allow a real time connection between the electorate and their elected representatives…. Lobbi is an innovative and unique method of engaging the electorate to become re-enthused and involved with politics on a long-term basis. This is created through the ever-growing power of social media, with a Facebook/Twitter-esque interactive forum and information portal. Lobbi provides the voting public with the means to discover current issues that affect them – instantly – via their smart phone, tablet or computer. In addition, they can get their own views across in the same way as they’d post on Facebook or Twitter. But more than this, it’s a two-way street, as politicians and elected representatives also interact, giving them a vital link to the public mood on a ‘real-time’ basis. You might ask, what’s new? I’ll come to that … but first, what’s not. You can find a free event most months in London about how we need to revive democracy, and fairly frequent discussion of the role of the Internet. We are still asking Is e-democracy now a reality? as the BBC reported in 2007, with periods of excitement around the role of social networks in the Arab Spring and the success of the Five Star Movement in the Italian election. What’s certain is that we have plenty of online spaces for general campaigning, and specific systems for civic engagement, whether developed for citizens by mySociety or agencies like Delib. Consumer Focus has sponsored a Digital Engagement Cookbook with 68 recipes, and Helpful Technology offers a Digital Engagement Guide of practical help and ideas. For a wider perspective, just look at the programme for Personal Democracy Forum in New York next month. For advice on what’s worked or not, check in with Steven Clift who coined the term e-democracy in 1994 and has been promoting it globally ever since. Steven is particularly informative on the hard slog of achieving an inclusive approach, which may come more by knocking on doors and using email lists than new social tech functions. So how might Lobbi make a difference? At this stage I should declare an interest, because I’ve been engaged in discussions on a Lobbi Linkedin group over the past few months, and also invited to join a smaller group next week to help inform strategy. I’ve worked with Steve Moore, who is leading Lobbi development, on a number of projects, including in the early days of Big Society Network. Steve is now developing Britain’s Personal Best (BPB) “which convenes thousands of organisations and millions of people to achieve a personal accomplishment over the course of one weekend each year”. He’s a man with the ability to carry though a big idea. I don’t know what the Lobbi strategy will be. That depends in part on discussion next week. As Hoz indicates, a mobile-friendly system is under development that could, potentially, connect elected representatives in an area with citizens there, enable reporting of local problems to agencies, and encourage neighbour-to-neighbour cooperation. However, old hands in this field will warn that tech doesn’t do it alone. Firstly, just build it … and they probably won’t come. Why should citizens embrace a new system if they are happy with Facebook and its scope to create groups, pages and networks? Why should politicians and officials engage in a system that may not integrate with the ones they already have in-house? Secondly, local politics and community action requires a blend of online and offline activity. That’s not just because a third of people may not be online – a point made by Chi Onwurah MP at this week’s event. Or that, in my experience, relatively few community activists are enthusiastic online activists. It’s also that getting things done, once you go beyond Clicktivism, involves building new relationships and trust, working through ideas and options, and making decisions in complex situations. Online isn’t enough for that. Thirdly, if you do manage to get a lot of people online in the same place, you need to put a lot of effort into facilitation and site management. That’s a skilled operation. The more ambitious you are, the more the costs and management issues increase. Where will the revenue come from, not just to manage and develop systems, but to fund the offline activity? I suspect that in further discussions to refine Lobbi, those experienced in the field will suggest either focusing on one activity that current platforms and programmes are not offering – and do that really well. Or aim to connect some of the very disparate online activities currently underway. And to be agile – try stuff out small scale, revise and redevelop. My hunch is that given Hoz’s passion, combined with Steve’s contacts and convening skills, Lobbi might do well by aiming to be as much a movement and community as a new platform. What was very evident at the Downloading Democracy event was the number of people who’ve been around the scene in the last six or seven years welcoming the chance to meet up for a chat. After a burst of activity in 2007-09, and the failed hopes for Big Society, we’ve rather lacked the social spaces to bring together social techies, community activists, new-style democracy advocates … well, forget the labels, I mean people who want to do good stuff locally using a mix of methods new and old. At local level, there’s general accord that it makes sense – particularly in hard times – to go for an approach that makes as much as you can from the strengths of local people, projects, and buildings before developing new initiatives from scratch and seeking funds that might otherwise support existing initiatives. 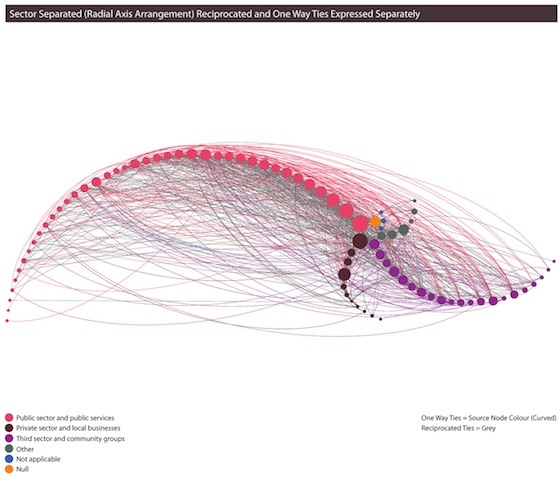 Map existing assets and networks, and concentrate on community building. Social technology can help in that process, as I’ve explored here and here. Maybe there’s a couple of new angles for Lobbi: one focused, one more open. First, if looking for a niche, consider focusing on how to digitally enable the enablers who help build communities. What help do they need in the personal use of technology, how can they help others, how can they enable their organisations. Go person-centric. Second, take an asset-based approach nationally. Map who is doing what in this first, and aim to build connections both personal and technical. Use that knowledge both to advise and build kits for the enablers, and to create a strong community and movement for technology-enabled social action. Hoz and Steve have been generous in bearing with the challenges that I and others have raised during earlier discussion, welcomed new ideas and connections, and remained determined to press ahead. With that sort of spirit, Lobbi could be a catalyst for a fresh approach to politics and local action. There’s a term in evolutionary biology called punctuated equilibrium which suits the uncertain times we are living in. The gist is that big changes in living organisms largely occur in short episodic bursts when their external environment undergoes some form of drastic change. In such terms, the current multiple crises in democracy is being driven by sudden and rapid technological advances in human communication. The resulting uncertainty is a necessary precondition for the emergence of novel theories and practices for how we might functionally respond, both as collectives (nations, communities, sharers of a global environment) and individuals (politicians, priests and citizens). None of us really know where any of this is taking us, though we can see and feel seriousness of the deficits that arise as a result of the disruption of ‘business as usual’. There are no road maps. When life isn’t business as usual, we need people like Hoz and Steve. If only to get me blogging about this stuff again. Below are 10 messages to consider in planning any project using digital technology to engage young people and address the key challenges they face. I think most are relevant to any digital engagement process. This Thursday we brought together a fantastic crowd of 25 thinkers, social entrepreneurs, funders, youth workers and young people at the RSA in London to explore some of the messages that had been emerging so far in our Young People and Digital Technology exploration. In a packed two hour session we took some headline challenges faced by young people (youth unemployment; lack of youth influence of local decision making), and dug a bit deeper into them to find underlying challenges and unmet needs. With that as our context, we looked at the messages identified so far, which had been printed out as cards, and discussed them in groups to see how they might be relevant to the challenges. I’m excited both by the quality of ideas generated so far, and the potential for this sort of exploration that blends online and face-to-face discussion. Fortunately we are following the number one message in our process. If you have further ideas, please do contribute through the crowdsourcing document, or get in touch directly. I’m sure we’ll be hearing a lot more from Government in coming months about localism and the expectation that people will do more in their communities – not just as volunteers, but in running services. Big Society may be out of the news as a phrase, but the policies are working their way through to implementation. Last week a report by Liz Coll for Consumer Focus addressed the key issue of whether people are ready to commit more time and effort: Hands up and hands on – Understanding the new opportunities for localism and community empowerment. This is one of the few pieces of work that looks at how well does the rhetoric of localism actually marry with reality – we have the community right to bid and community right to build. We have all these new rights for community members to take some quite serious action in their community. But to what degree are people ready to do that? That’s what this report looks at. It shows that there are some quite profound challenges. There are quite a large group of people who want to be involved and influence, but fewer people who are currently ready and willing to actually go in and deliver services themselves. Edward emphasises that there are unlikely to be any short term solutions, because it takes time to build confidence and capability among local groups: a lesson familar to anyone involved in community action. This is not a short term game. It takes time to build confidence and capacity. Nor is “community” synonymous with collaboration: there may be many conflicts of views and priorities in any neighbourhood. The report starts by giving a clear overview of the different ways in which people participate: by having influence, becoming more actively involved, or actually taking control. That’s rather on the lines of the ladder of participation model that has served fairly well for some time. The report goes on to examine how far people will commit at the different levels. Conclusion – not as much as government might hope. The assumption made during the latest drive towards localism is that that there are significant numbers of people ready and willing to participate in decision making and control of local services. While this may be the case in particular communities, our research has uncovered a more mixed reality on the ground which needs to be acknowledged. While 82 per cent of those surveyed agree people should have more say, and 69 per cent support the notion that local people should be more actively involved, when it comes to actually doing something personally the figure drops to 28 per cent. The report says that about a third of people are already involved in various ways – and there is the potential for greater involvement if we have a good understanding of people’s motivations (personal commitment, social connections, current circumstances) and recognise possible barriers. The barriers include lack of information, lack of time, lack of faith in local authorities, a core group of activists putting people off, and lack of return on investment (why bother). The recommendations include focussing on the right people – the 28 per cent; being insightful about motivations and barriers; developing opportunities; and being open and realistic. The report doesn’t break any new ground, but it is admirably concise and provides a sound reality check on what’s possible if we carry on aiming for more engagement in the same old ways, with the same old attitudes from agencies. It’s too early to judge whether new methods of community organising and community building that I touch on here will make a big difference: but there probably aren’t likely to be any quick gains. The experience on the ground has been hard going. Some of the trainee organisers have said how difficult they have found it to move people from a vague sense of engagement at the door to actually taking action a few days later. I found myself repeatedly listening to residents, having a successful conversation with them leading to a clear commitment to action and then being disappointed when they did not follow through. When I tried to contact them again, they just seemed to go to ground. This experience has been widely shared across the network. On the other hand, some trainees have been able to persevere and come through to a place where they are joined by volunteers in their listening and find people willing to draw some friends together for a chat about the area. These ‘voluntary community organisers’ in waiting are key people to help make the local network of citizens come to life. The focus has turned – as it has for me in the last few weeks – to helping these individuals to pursue their project idea or to get out listening to friends and family. The time for the foundational listening has been limited by these other demands. It sounds as if the lesson is similar to that in the Consumer Focus report: look for the willing. The problem is you have to knock on a lot of doors to find them. Later this month I’ll be doing some work with Gary Loftus and his new team of community builders at Forever Manchester, when we’ll spend a day exploring how social reporting can play a part in Asset Based Community Development. As you can see here, I found some great stories when I reported from an ABCD conference that Forever Manchester ran with Cormac Russell and Jim Diers in November. Community builders need to use a range of communication methods to find out and map what’s happening in an area, build connections, and help people communicate better themselves. I think there’s a good fit with the ideas and practices of social reporting, and also the development of digital literacy that I sketched here. Mark and I have had some stimulating chats in the past – but this post really brought home to me the big gap between networking realities on the doorstep, and the more optimistic hopes we may have for networking civil society. It’s not just to leave the minority out of the network by focusing mainly on digital means. We must find ways of using the online experience to drive real face-to-face networks. We need a sophisticated understanding of the impact that online networking, and practices like citizen journalism, may have in an area – as I touched on here. I don’t think any of this downplays the importance of social reporting and digital literacy skills for community builders and organisers. As well as networking citizens using a range of methods, old and new, they will also need to bridge between the increasingly digital world of news and knowledge, and conversations on the doorstep. As both local papers and local voluntary organisations close, and councils move to digital-first, the risks of digital exclusion increase. Building community will mean supporting those with least online access to create more effective networks with each other and with those who are more powerful. Who you know has always been as important as what you know, and increasingly both of those are achieved online: or at least started online. Relationship-building still needs face-to-face, but the range of possible relationships can be greatly extended online, and maintained in part that way too. It is difficult to develop projects with a group, when some members don’t have email, but others are sharing documents and tasks online. As Mark mentions in his post, some community organisers will be receiving digital media training from Locality and izwe. I’ll do my bit of network building by introducing Gary and Mark, and then look for more opportunities to connect community and social reporting, citizen journalism and community building and organising. One good opportunity may be at the Social Networking Below the Radar event being held next month at Big Lottery Fund. Hyper-local news, websites and blogs are inextricably linked to cohesion and engagement within communities. Many local bloggers and writers may not recognise themselves as citizen journalists, but they are telling their story and connecting local people. The first point is supported by the Networked Neighbourhoods research by Hugh Flouch and Kevin Harris, though not cited in the piece. Our experience suggests that social media is not the shortcut to higher participation that we all hoped it might be. On the websites and social networks we helped residents set up, the numbers of people who are engaging in conversation with each other is quite small. It varies amongst sites, but the highest is around 10% of network members. … which is why I bridled got cross about the Guardian piece’s second point, which implies that local online writers and bloggers should be branded (whether they like it or not) as citizen journalists. Some may like the label, other may feel that “journalist” is not currently a term that engenders a lot of trust among citizens, however unfair that may be to the majority that do an honest job. The Guardian piece is written by Gavin Sheppard, marketing director at the Media Trust, who are running Newsnet, supported by the Big Lottery Fund as part of People Powered Change. I’ve written lots before about Newsnet and its role in networking civil society, including an early challenge on How helpful is journalism for People Powered Change? The Poynter Street residents, like many communities across the country, may not recognise themselves as citizen journalists, but they are telling their local story, connecting with others and harnessing support for local people. They are reflecting many of the qualities of citizen journalism. This dedication to the local community deserves to be nurtured and supported and can benefit from learning, connecting and sharing with others. My challenge is on two fronts. First, that while mainstream journalism is essential for democracy, challenging powerful institutions, bravely reporting from wars and disasters … and keeping us amused … the news values of conflict, crisis, celebrity aren’t necessarily helpful to collaboration and community building, which is important in civic life. Thanks to Nick Booth of Podnosh for highlighting this a few years back. So while it is hugely important that some bloggers, like those in Preston, take on – and sometimes improve on – the reducing role of local papers in running campaigns and holding councils to account, “journalism” is only a part of the community media that we need. Some bloggers and users of social media in local communities want to call themselves citizen journalists, and hopefully take on the best aspects of journalism in being inquisitive on behalf of others, and “speaking truth to power”. Fine …. but to what code do they operate in the way that they report? And are they just a loud voice in the community … the equivalent of those who can dominate public meetings? Some are hugely ethical, collaborative, supportive of others … some less so. As journalists they don’t necessarily “connect local people”: that’s more of a role for community organisers and builders. We need a discussion around citizen journalism in parallel with that about mainstream journalism. We know mainstream journalism has to be, in part, about making money for the proprietors, balanced with a societal role. What are the equivalent tensions in citizen journalism? At the same time, the majority of those using social media in an enormous variety of ways for social impact do not choose to call themselves “journalists”. I explored this wide use of social technology with co-authors Amy Sample Ward and Andy Gibson in the NESTA-funded publication Social by Social a couple of years ago. So my second point is that trying to brand citizen media as citizen journalists is unhelpful. If people “may not recognise themselves as citizen journalists” it’s not for the Media Trust to say that they are. I think that Newsnet – which is funded £1.89 million by those of us who buy lottery tickets – could both play an important role in this discussion, and help amplify the work of those using community media. Adam Perry is indeed blogging about that on Newsnet. If Newsnet is going to stick to supporting “journalism” then we need some other ways to connect and amplify the use of social media for local social good … as I rambled on about here: The challenge of networking civil society. Although Newsnet was funded by BIG last year, and “launched” five weeks ago, it has yet to carry any news: their “single publishing interface” is still promised (see comments). The site is currently simple a set of blogs and forums within the Media Trust site (see discussion). So yes, let’s applaud the best of citizen journalism, but not put easy branding above some very complex substance. Disclosure: I worked for Big Lottery Fund last year exploring their role as more than a funder. Note to self: there’s another potential client gone. That’s the problem with being a social reporter … the critical journalist in me keeps breaking out. Increasingly the “social bumping places”** where we might come across other local residents in our communities are stores and supermarkets … and the RSA believes that this could be turned to greater advantage for both shops and shoppers. In a recent report called Community Footprint: Shared Value for Business and Communities, the RSA suggests that businesses “should act as ‘community hubs’, helping promote social interaction amongst their customers and developing local action plans to create happier, more resilient communities”. When I was in the RSA recently, talking to Ben Dellot about social network analysis and local Changemakers, I also spoke to Emma Norris, who is associate director of the Connected Communities project. Emma explained how they had worked with B&Q to research the relationship between their store in Sutton and local customers. They found 42 percent of customers had some interaction with other customers in the store and that 23 percent of customers asked other customers for DIY advice. Identify a member of staff who will be leading on community work – if possible a local person whose role should include building local partnerships with third sector organisation and social landlords. Design and create a central community orientated in-store space that can be used for training and skills events, customer information sharing and innovation. Businesses who are willing to be pioneering and give something back to customers and the community in concrete, tangible ways will feel the benefits. People will spend more in their stores and customers will stay loyal in hard times. What more can businesses hope for than that? The term Community Footprint refers to ways in which the project was able to measure the impact of a store in its community – both positive and negative. That means it should be possible to demonstrate quantifiable benefits … not just urge community engagement as a good thing. Social responsibility and ethical business can have a street-level focus. Emma said that the approach could be extended to clusters of shops, encouraging networking and collective benefits for shops in High Streets and other areas. The RSA has a large membership of Fellows, who are increasing active in RSA projects. Emma said RSA staff would be particularly interested in talking to Fellows who might want to take up the Community Footprint approach in their area. ** For more about social bumping places, see this report of a workshop in Manchester on Asset Based Community Development. 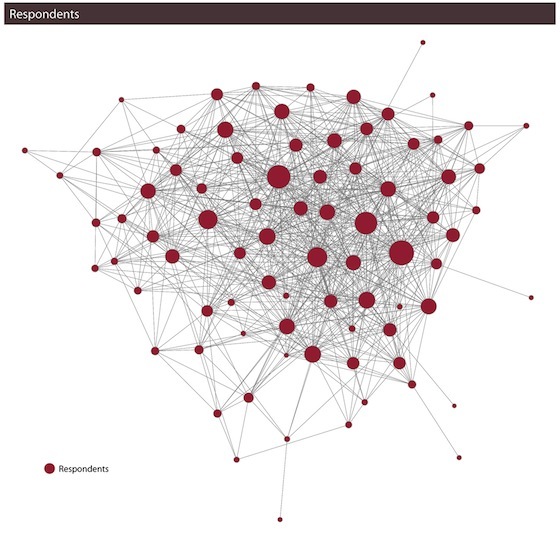 Over the past few years the RSA’s Connected Communities project has developed methods for mapping who knows who in neighbourhoods, and how they can form a social network. It is fascinating to see the maps that emerge … but how can this approach be turned to the advantage of the community? Among those we identified were members of the clergy, artists, head teachers, social entrepreneurs, housing officers, charity workers, police officers, businessmen and everyday council officers. The results of our surveying indicate that such individuals are adept at driving positive change in their local areas. They appear rooted in their communities, have an impressive repertoire of capabilities, and are instilled with an appetite to apply their skills and knowledge to address local issues. As Ben Dellot explains here, it is particularly important to identify people who can drive change at a time when public services are being cut back. Some will know each other – but many won’t have connected across public, private and voluntary sectors. Together they should be able to achieve more than they could without the benefit of wider network connections. The aim is for the network to be self-sustaining, as the RSA withdraws. The initiative has been supported by RSA Fellows (members), and this makes it easier to replicate the process in other areas and eventually build a network of networks through which Changemakers can find others with similar interests. I think it is going to be fascinating to see how people from different organisational backgrounds work out how to organise within a networked context … and how any projects teams they form on a peer-to-peer basis can then work with more formal organisations in the city. Will they operate on a purely voluntary basis? If they do need funds, how will that be handled? How are application to join the network made? Will they be criticised as an elitist group? How will decisions be taken? All of these are issues that I think we’ll have to face more widely as we try and make the most of the human and social assets in our communities, and move beyond, or re-invent, the civic structures developed over the past century. It is in spaces and processes which bring together people with different interests, expertise and resources that innovation is most likely to occur. It is also here that we can identify ‘the hidden wealth’ (a capacity for creativity, generosity, trust and solidarity) which often lies dormant trapped between specialisms and hierarchies and crushed by narrow incentives. 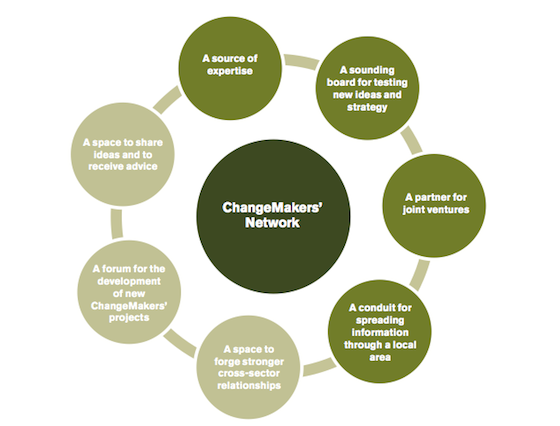 The Changemakers network in Peterborough looks as if it will be an excellent test of just what is possible through this approach. Summary: local activists and volunteers need to share their achievements and experience in hard times. The publicly-funded sites for this have some limitations, and smaller sites, mainly run by volunteers, don’t have the resources to grow. Is there scope for more joining up, rather than further top-down solutions? Government policies of localism and cuts to the voluntary sector are pushing citizens and community groups to do more for themselves on the ground, and find their own ways of learning from each other nationally. A couple of recent events prompted me to review what is available online. The neighbourhood engagement team are working to open up the conversation on neighbourhoods policy to a greater range of people: sharing enthusiasm, tapping into a wider pool of ideas and examples and exploring how government can best support those who want to have greater control and influence in their area. Workshops and online platforms will empower those active in the community to continue the conversation across professional silos, supporting each other to innovate in local arenas with less central government direction. The second event was a webinar, organised by Globalnet21, on whether social networking can “help create a network of mutual independence that strengthens the countless groups that are the social glue of our civil society”. That nudged me to prepare the slides that I posted earlier, based on work I did last year with Big Lottery Fund, as well as the blogging I’ve done here about social reporting. I’ve linked a lot in this piece so you can find starting points for your own research, and draw your own conclusions. When we look at a successful example of online collaboration the most obvious visible element of it is often the platform being used: whether it’s a Facebook group, or a custom-built intranet. Projects to support online learning, knowledge sharing or dialogue can quickly get bogged down in developing feature-lists for the platform they think they need – articulating grand architectural visions of a platform which will bring disparate conversations together, and which will resolve information-sharing bottlenecks in an organisation or network. But when you look closer at any successful online collaboration, you will see that it’s not the platform, but the people, that make it work. People need opportunities, capabilities and supportive institutional cultures to make the most of the Internet for collaboration. The capabilities needed range from technical skills (and, on corporate networks, the permission) to install and use programs like Skype, to Internet literacies for creating hyper-links and sharing documents, and the social and media literacy to participate in horizontal conversations across different media. But even skills and capabilities of the participants are not enough to make online collaboration work: there also needs to be a culture of sharing, recognising that the Internet changes the very logic of organisational structures, and means individuals need to be trusted and empowered to collaborate and communicate across organisational and national boundaries in pursuit of common goals. Online collaboration also needs facilitation: from animateurs who can build community and keep conversations flowing, to technology stewards who can help individuals and groups to find the right ad-hoc tools for the sorts of sharing they are engaged in at that particular time. Online facilitators also need to work to ensure dialogues are inclusive – and to build bridges between online and offline dialogue. In my experience facilitating an online community of youth workers in the UK, or supporting social reporting at the Internet Governance Forum, the biggest barriers to online collaboration have been people’s lack of confidence in expressing themselves online, or easily-address technical skill shortages for uploading and embedding video, or following a conversation on Twitter. Building the capacity of people and institutions, and changing cultures, so that online collaboration can work is far trickier than building a platform. But, it’s the only way to support truly inclusive dialogue and knowledge-sharing. Plus, when we focus on skills and capabilities, we don’t limit the sorts of purposes they can be put to. A platform has a specific focus and a limited scope: sharing skills lays the foundation for people to participate in a far wider range of online opportunities in the future. The challenge of supporting sharing and local innovation was picked up last year by the Big Lottery Fund (BIG) under its banner of People Powered Change, with investments of £5.76 million in a range of programmes including Your Square Mile and the Media Trust’s Newsnet, as I first wrote about here, and followed up later. I then worked with BIG for a few months exploring, with John Popham, how they might be more than a funder. Posts here. As part of that work I put together a Netvibes dashboard taking feeds from the main community and voluntary sector sites. I’m a little circumspect in what follows, because BIG is a client, and I know the people involved in Newsnet and Your Square Mile, and admire what they are trying to achieve. Here’s Linda Quinn of BIG, Gavin Sheppard on Newsnet, Paul Twivy of Your Square Mile, in interviews last year. The bad news is that at present it is almost impossible to find out what is going on, where to get help, how to to connect. 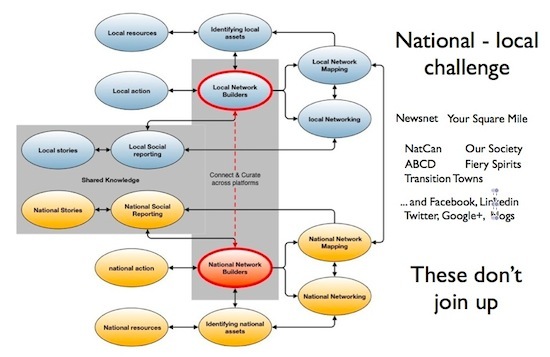 As I aimed to show in this slide from the webinar (pdf download), there’s a big gap between local networking and national, with many unconnected initiatives in between. I know it is early days, but as well as the CLG neighbourhoods team work, further announcements are due soon from BIG about People Powered Change (see below), so it is a good time to review progress so far, and how to build on or complement those investments. We have the elements of a rich knowledge ecosystem if we can join them up. Your Square Mile (£830,000) has a powerful vision of what people may need locally, and a site that does a smart job of aggregating useful data and advising people about local services and the part they may play. There is currently no networking, but that may be a feature of next stage development. Baroness Newlove, Government’s Champion for Active Safer Communities, favours the site as the hub for community activists, as I reported earlier. In addition Newsnet (£1.89 million) has a vision of local hubs to connect a network of citizen journalists. Their site has some limitations, but there is interesting discussion and some good examples of hubs, with ways to upload and network news promised later. In my view something like Newsnet has great potential if it can blend the dynamic of community reporting with citizens finding their own voices to tell their own stories. However this will take time, and on current plans Newsnet site will be archived in two years, when BIG funding ends. We can’t reckon it will be a long-term element in the mix (however, see update below). Meanwhile a range of unfunded online communities like Our Society, ABCDEurope, and NatCan are doing well in each attracting hundreds of members and a wide range of discussion and resources. Networks like Transition Towns, Fiery Spirits and i-volunteer show what is possible with some modest investment in platform, and far more facilitation. Tim Davies facilitates Youth Work Online here. (Disclosure: I’m one of the group running Our Society). Mandeep Hothi, writing for Guardian Voluntary Sector Network, reports on the results of some other BIG-funded work supported by DCLG’s Empowerment Fund, confirming again that investment in social media and technology is not in itself the answer. It is people who connect. Social media can amplify and assist … but we need to understand the fine grain of how that works as a blend of face-to-face, SMS, email, forums, Facebook and other methods. Another of the People Powered Change partners, NESTA, are just beginning a big programme of research and development in the field of hyperlocal communications. Interest from the BBC may help catalyse a network of hyperlocal activists in London. So … we know that just investing in technology isn’t the answer, and that instead it would help to improve and support the digital literacy of activists. We know there are a number of programmes that could join up to achieve this: I’ve only highlighted a few. But who is going to help bring it together? Big Lottery Fund is a strong supporter of the idea of asset based community development: making the most of the resources that you have in any neighbourhood, rather than just looking at the problems and putting in more funds. Could BIG apply that philosophy to networking for civil society? We’ll then spend some time working our thoughts into an overall strategy that will inform a paper to our Committee in March. My sense is that much of what we discussed is about how we engage, how we share and how we collaborate. Some of this I think we can test out in pilots, some of it requires us to think how we might change our internal processes but all of it requires that we carry on the conversation with those who have helped us so far and hopefully will remain constructive critical friends and supporters in the future. In drafting this post, I started at this point to write that Power Powered Change phase two, when announced, may be more about investment in people than in technology platforms, and that it might be developed in part by bringing together the various initiatives I’ve mentioned, and others, to co-design something for the future. However, I don’t know if that will be the case – and on reflection I don’t know that we need to wait on BIG … however welcome their support would be. I then wondered whether there was more scope for joining up the smaller sites I mentioned – even if only by sharing newsletter items and some feeds, and having a shared signposting system of who is doing what where: a more accessible version of the Netvibes dashboard I developed. Ideally this network of networks should be animated by some social reporting … helping people make sense of the civil society ecosystem, and joining up conversation. It would be the online equivalent of local community building, in this instance designed to make the most of the knowledge assets that we have. What do you think? Is there a problem for activists trying to get information and advice, and connect with others? If so, should we follow Baroness Newlove’s suggestions, and focus on the development of one site, like Your Square Mile? Or should we try and build a knowledge ecoystem of smaller sites, and of civil society organisations better able to network online? (By we, I’m thinking of those who manage online communities or other civil society sites). The NESTA hyperlocal research and development programme is very timely. Maybe we need something similar at national level. “Whilst the BIG funding is for another two years, we’re committed to supporting the platform beyond that date. Obviously further development will depending on what funding is available to us, but I see no reason why the community can’t continue to grow beyond 2014”.